Here are a few of the Best Board Family Games to Buy in 2017! Charades for Kids| If you have younger kids, they might enjoy this Charades for kids. They simply act out what they see on the card and let their teammates try to guess correctly. Hot Potato Game| Don’t be caught with the hot potato at the end! Pass the potato around as fast as you can, and try not to be holding it when the music stops. Yeti in My Spaghetti| Try not to be the one that drops the Yeti, or you lose. Place noodles across the top of the bowl and then set the Yeti on top. Each person takes their turn removing noodles one by one, and the goal is not to have the Yeti drop during your turn. Watch Ya’ Mouth Family Edition| Put the mouth guard piece in your mouth and see if your team can successfully guess what you are saying. This is a family version that is truly a tear raising game! Jenga| It is a classic game but boy is it a ton of fun. Simply remove a block and place on top of the tower without knocking your tower over. Apples to Apples| Let your kid expand their vocabulary in this fun fast-paced game. They will have a blast making comparisons and working quick on their feet thinking what fits the other person card. Blokus| This is a strategy game that really makes you think on each move you make. This game really encourages creative thinking! Skippity| You have a board that is full of colorful skippers. The goal is to collect the most sets by simply skipping over the colors you need while still working to block your opponents. What are some family board games your family loves to play? These are all great picks. We have a few of these, but our favorite by far is Watch Ya’ Mouth. That one is just too much fun. These all sound like great games. I’m a big supporter of old school family game night, and I think any of these would be perfect gifts. What a great selection of games! I am going to have to pick some of these up, we spend Christmas Eve and Day with cousins and this looks like something all ages can enjoy! Thanks for the recommendations! I’d love to play Trivial Pursuit Family Edition. I like useless, and useful trivia. I’d play hot potato with the kids. All are really good game choices! My family would love the 5 second game and the Watch Ya Mouth. I will have to pick up some of these games and have fun with the family on our movie/game nights! This is the perfect list of best family guys to buy in 2017! They had some pretty awesome releases for new games this year! I HAVE to get Watch Ya Mouth…That will be the hit of our Christmas party with fam. I haven’t heard of the others, but I’m sure they will also be fun to play! We really enjoy having family game night but our current selections are getting a little dull. Your suggestions rock and Watch Ya Mouth is going to the top of our list for sure! I love playing hot potato with my kids. It’s great that you can take it anywhere. Great ideas for presents! We love to have a family game night, and I think games are always a perfect idea for Christmas. We will have to get some of these! My kids are grown ups but we still enjoy playing board games on the weekends when are all together. I think I would add Trivial Pursuit Family Edition to our board games collection. That would be so much fun! The 5 second game seems pretty cool. I can see playing that in the car to keep kids busy. We love Apples to Apples. It’s such a fun game for the whole family to play. These are all great games to play with your family. Our favorite right now is Giant Jenga. We always have a great time. We love to play board and card games. Apples to Apples and Monopoly are two of our favorite games. This is a great list! We love playing family games for Christmas and family gatherings. Would love to try some of these! This is such a fun list! 5 second rule is a ton of fun. We love playing games and I’ve got my eye on Watch Ya Mouth! Looks like a fun game. We’ve been playing The Game of Things a lot lately. It’s not new, but we love it. I’ve been looking for family game recommendations and these are great. Putting these on our list! I’d like the 5 seconds rule. It can be really challenging and exciting. It would also be thrilling to play hot potato. These sound like some fun games to play. I admit, we haven’t played many games as a family since we’re all so busy. I should probably schedule a family game night! Apples to Apples is one that I’ve actually been wanting to try for quite some time. We recently purchased Pie Face which we loved as a family – will have to check out your recommendations as well. I love Apples to Apples! It’s probably one of my favorite games to play. Our family it’s really competitive on it and by the end we are laughing so hard. These are all really great choices. We love a good night of family games! Apples to Apples is one of our favorites. We love Apples to Apples. It is one of our family favorites for game night too. This is a great list of family friendly games. I gotta get Hot Potato for my kids. I remember playing that as a kid and I think my daughters would love it toO! My kids said they want games from Santa. I have never played Jenga before, my kids are amazed by that. 5 Second Rule sounds great. We often have guests over and those games will be great for entertainment! I just love family games. I’m out of the loop on many of the new games out there so this post is really helpful. Thanks for sharing. Thanks for the great reminder to get new games for the family. Now that the holidays are fast approaching, there will be more time for us to bond as a family. I think I will pick up Watch Your Mouth first. That looks like it will bring so much fun and laughter! 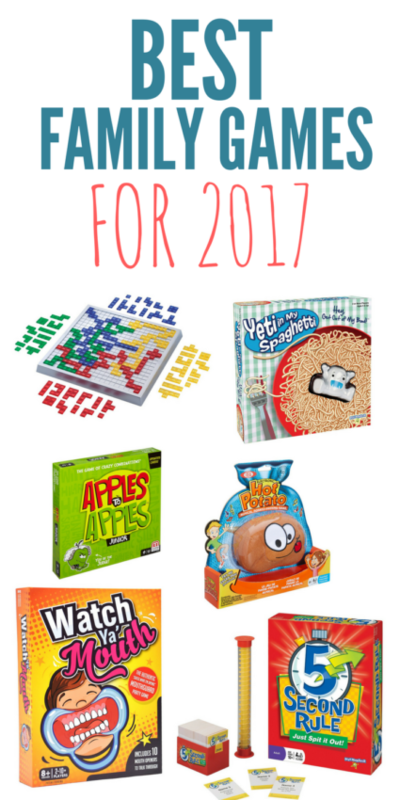 Of all the games you talked about in this post I think my fave is Apples to Apples! I love that game!! I also love the game of Life and Monopoly!! Apples to Apples is my favorite! We play when my brother and his family comes up to visit. Five Second Rule sounds like a fun one! We absolutely love family Game Night, especially now that the weather has turned cold. My boys really want to try out Yeti in my Spaghetti. You have a lot of games listed here that we love! Some new ones for me too! Ohhh, I should try and get more board games and try and get the kids to play. Yeti in my Spaghetti looks adorable!